Bentley was a walk-on in college who led the team in rushing as a senior and most notably scored the winning touchdown in the Orange Bowl upset of Nebraska that capped the 1983 season. His pro career started in the USFL after he was chosen by the Chicago Blitz in the first round of the 1984 draft (seventh overall) and his rights were traded to the Michigan Panthers. He saw limited action as a rookie, primarily returning kickoffs. The Panthers merged into the Oakland Invaders in ’85 and Bentley played a far more prominent role, rushing for 1020 yards on 191 carries (5.3 avg.) and catching 42 passes for 441 more yards. 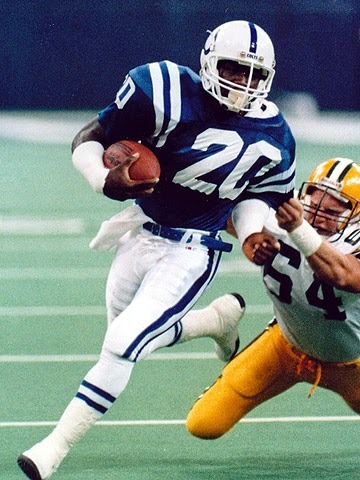 With the demise of the USFL, Bentley joined the Colts, who had selected him in the second round of the ’84 NFL supplemental draft. He performed well in a backup role in 1985 and ’86, rushing for 639 yards with a 5.0 per-carry average, catching 36 passes for 315 yards, and averaging 23.1 yards on 59 kickoff returns. He started the 1987 season at running back, but the arrival of RB Eric Dickerson in a midseason trade significantly cut down on his playing time. Colts went 9-6 in the strike-shortened season (three games were played with replacement players) to finish first in the AFC East to reach the postseason for the first time since moving to Indianapolis. Lost AFC Divisional playoff to Cleveland Browns (38-21). With Dickerson carrying the bulk of the load at running back, Bentley returned to being a role player with his slashing running style and ability as a receiver out of the backfield. While he ran the ball only 120 times in 1988 and ’89, for 529 yards (4.4 avg. ), he caught 78 passes for 777 yards (9.9 avg.) that included 52 receptions for 525 yards in 1989 alone, when he was used more as an H-back. With Dickerson suspended early for the first part of 1990, Bentley saw more action and went on to lead the Colts with 71 pass receptions, for 664 yards, while also running the ball 137 times for 556 yards (4.1 avg.). However, a knee injury suffered in the first game of the ’91 season that required surgery effectively ended his career. He was active for two games with Pittsburgh during 1992 in which he had no carries or catches and returned one kickoff. Overall with the Colts, Bentley rushed for 2355 yards on 526 carries (4.5 avg.) and caught 226 passes for 2245 yards (9.9 avg. ), scoring a total of 28 touchdowns. He also averaged 21.5 yards on 148 kickoff returns. His USFL totals were 1080 yards on 209 rushing attempts (5.2 avg.) and 44 pass receptions for 448 yards (10.2 avg.) while averaging 23.2 yards on 26 kickoff returns and scoring seven TDs.